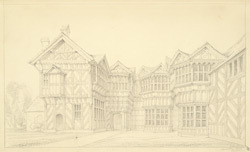 This pencil drawing depicts the exterior to the hall with its finely decorated gables and walls. Little Moreton Hall is a spectacular example of English vernacular architecture. The building has changed very little since it was completed in 1580. The exterior is characterised by a mass of half-timbered gables and ornate windows, all displaying fine carving. The interior possesses contemporary oak furniture and pewter; the elaborate Long Gallery retains its original wood panelling. The building lacks any particular order and its gradual growth over time has led to it appearing misshaped and out of proportion .